The Balancing Barn is situated on a beautiful site by a small lake in the quintessentially English countryside. The building takes the form of a barn, updated with shiny metal cladding. The Balancing Barn aims to make people re-evaluate the countryside as well as make contemporary architecture accessible. In addition to this, it is both a restful and exciting holiday home, boldly designed to provoke a gut response to architecture and nature over a short stay. Located in the charming British countryside near Thorington in Suffolk, The Balancing Barn’s architecture and engineering is a dramatic response to the picturesque natural setting. The traditional form and pitched roof make reference to the local agricultural vernacular, with an updated aesthetic. In this sense, the Balancing Barn aims to live up to its philosophical goal of re-evaluating the countryside and making modern architecture accessible. In addition to this, it is both a relaxing and exciting holiday home. Furnished to a high standard of comfort and elegance and set in a quintessentially English landscape, it engages its temporary inhabitants with a new way to experience the countryside. Approaching along the 300-meter driveway, the Balancing Barn appears at first to be a small, two-person house. It is only when visitors reach the end of the track that they suddenly experience the full length of the volume and the cantilever. 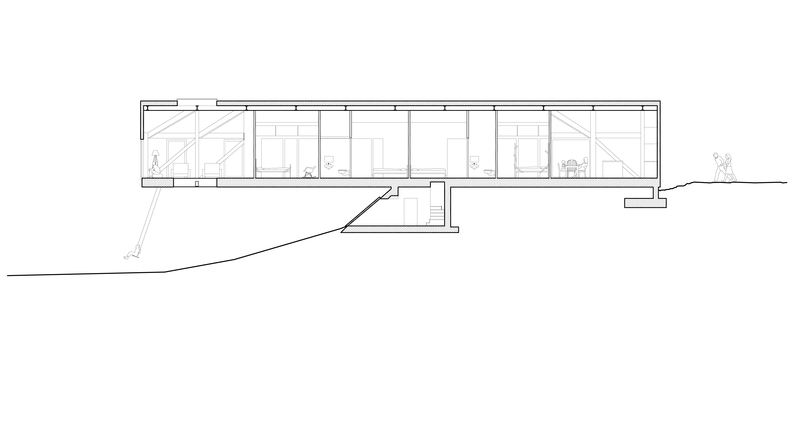 The Barn is 30 meters long, with a 15-meter cantilever over a slope, plunging the house headlong into nature. The reason for this spectacular setting is the linear experience of nature. As the site slopes, and the landscape with it, the visitor experiences nature first at ground level and ultimately at tree height. The linear structure provides the stage for a changing outdoor experience. At its midpoint the Barn begins to cantilever over the descending slope, a balancing act made possible by the rigid structure of the building, resulting in 50% of the barn hanging freely in space. The structure balances on a central concrete core, with the section that sits on the ground constructed from heavier materials than the cantilevered section. The long sides of the structure are well concealed by trees, offering privacy in and around the Barn. The Barn's metal facade reflects its natural surroundings and the changing seasons. On entering, one steps into a kitchen and a large dining room. A series of four double bedrooms follows, each with separate bathroom and toilet. In the very centre of the barn, the bedroom sequence is interrupted by a hidden staircase providing access to the garden beneath. In the far, cantilevered end of the barn, there is a large living space with windows in three of its walls, floor and ceiling. Full height sliding windows and roof lights throughout the house ensure continuous views of, access to and connectivity with nature. The Barn is highly insulated, ventilated by a heat recovery system and heated by a ground source heat pump, resulting in a highly energy efficient building. A stay at the Balancing Barn can be booked through Living Architecture (Website). It sleeps 8 people comfortably and is often booked many months in advance.